Weeks, William Raymond, (1848-1919) 763 Broad Street, Newark, New Jersey; 206 Claremont Avenue, Montclair, New Jersey; 315 West 106th Street, New York, New York. Lawyer and numismatist. He was born at Newark, New Jersey on August 4, 1848, son of John Randel Weeks (d. 1879) and Mary Frances (Adriance) Weeks. He graduated from the Newark Academy in 1865. He served in the New Jersey militia during the Civil War. He married Irene Le Messena in 1869. They had two daughters. He was admitted to the bar and practiced law in 1870. He was admitted to the Bar as counselor in 1876. He was an active life member of the ANS since May 16, 1882. He was the historiographer of the ANS. He collected Early American Copper -Colonial coins, Large cents and medals. He also wrote to the Chapman Brothers on December 2, 1885 telling them he owned the finest collection of 1839 Large Cent varieties known. Fig. 1. 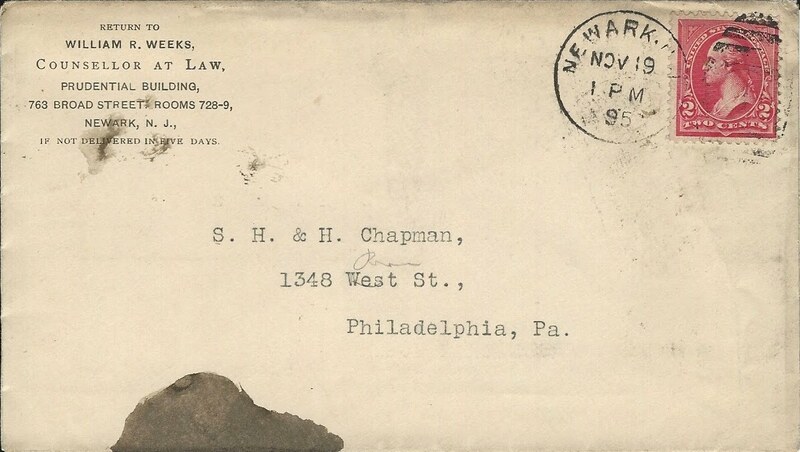 Postal Card (Scott # UX 8a) sent by Weeks to the Chapman Brothers postmarked at Newark, N. J. on December 2, 1885 with hand-stamped duplex with ellipse No. 2. 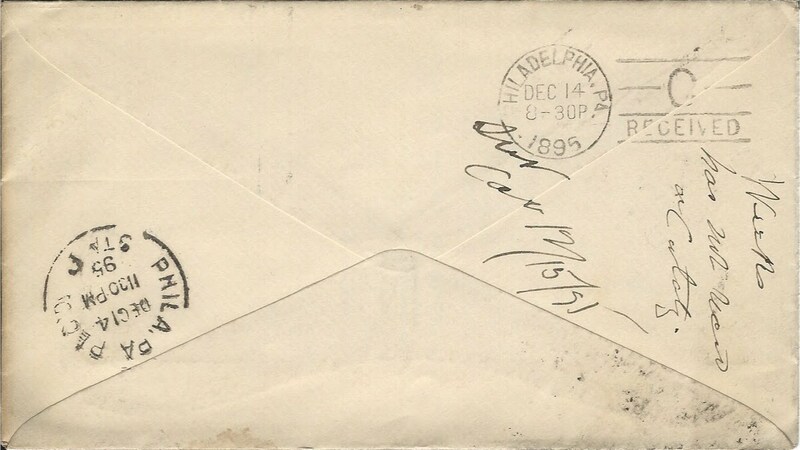 The "Received" stamp at Philadelphia on front as typical. Clarke # R20 (4/18/1884 - 9/8/1886). Courtesy the Lupia Numismatic Library, Special Collection, The Chapman Family Archive. Fig. 2. 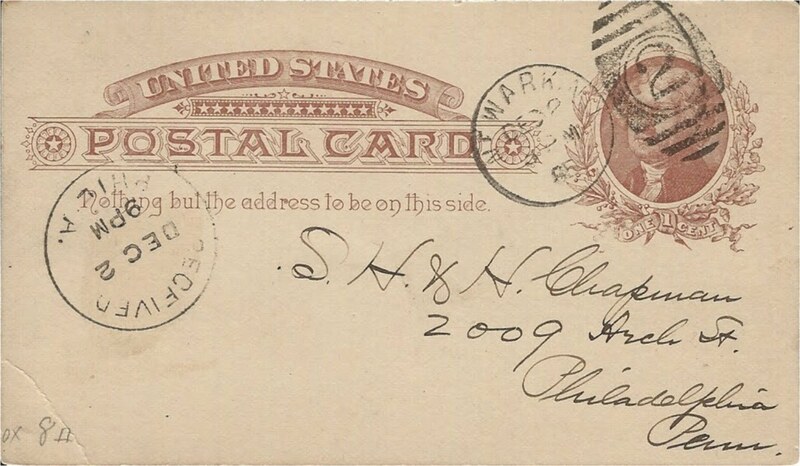 Postal Card discussing anticipated bids on the Chapman coin auction held December 15-16, 1885: "You may remember my buying the Bushnell 1839 over/36 Cent, said to be the best (as to condition) then known. I think I have the finest set of 1839 cents in any collection and the largest number of variations in die cutting of that year. If your /39 was finer than the Bushnell piece, I wanted it, but would not bid more than $2; without seeing it. My 1814 plain 4 is uncirculated, fine color, but has the usual failing of being a light impression; but in this case I do not wish to make any bid at all without seeing the piece. Yours truly Wm. R. Weeks." In smudged brown ink the Chapman notation "O 12/4/85" signifying they sent out a reply on that date. Courtesy the Lupia Numismatic Library, Special Collection, The Chapman Family Archive. In 1883 he organized the Bloomfield Volunteer Fire Department. In 1895 he was admitted to the New York bar and opened an office there at 50 Broadway, New York. In 1885, he became a Life Member of the New Jersey Historical Society. He was elected recording Secretary from 1890 – 1894. 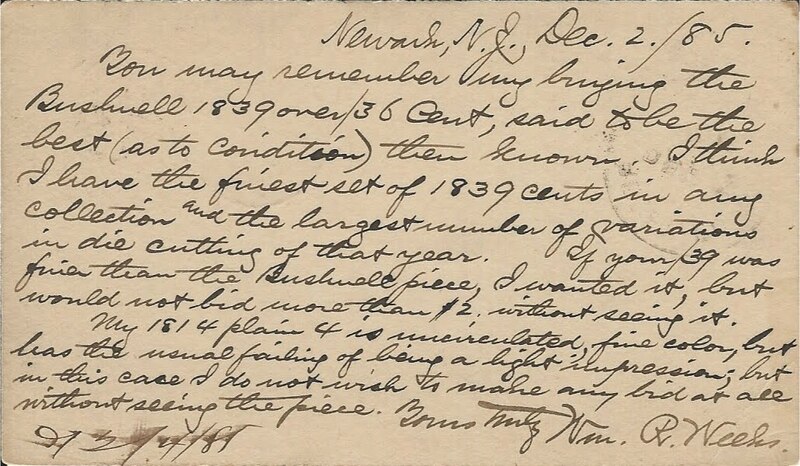 In 1892, he sent a copy of S. S. Crosby, The Early Coins of America (1873) to Francis Bazley Lee, Trenton, New Jersey to help him with his research on colonial coinage in the state of New Jersey. Fig. 3. 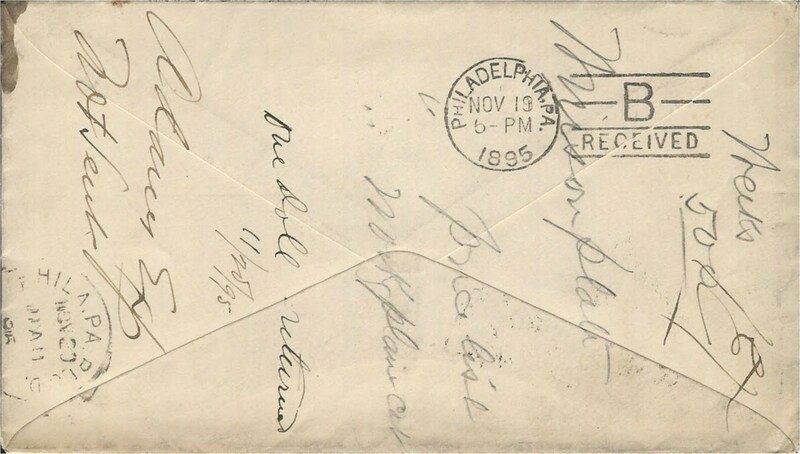 Weeks' reply card postmarked November 18, 1895, at Newark, New Jersey, from the Chapman Brothers circular regarding the Richard Boswell Winsor sale. Philadelphia RECEIVED at Station B. (Clarke No. 90c.) on front overlapping the Newark postmark. Courtesy the Lupia Numismatic Library, Special Collection, The Chapman Family Archive. Fig. 4. 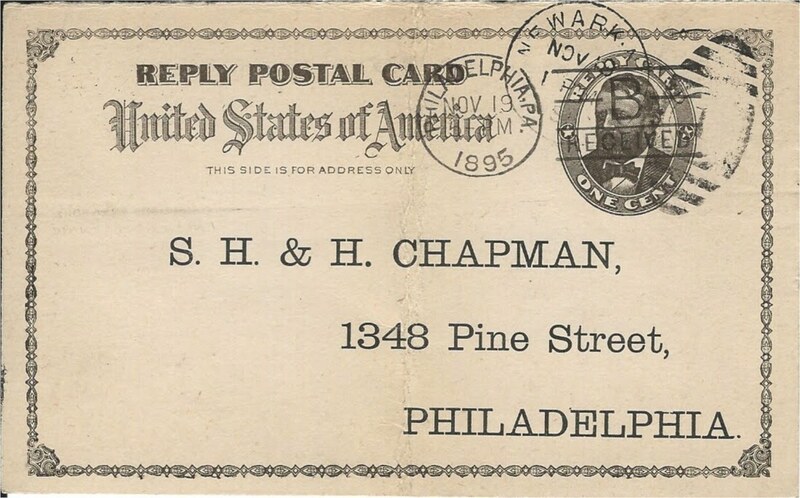 Weeks' postal card reply to the Chapman Brothers, November 18, 1895. 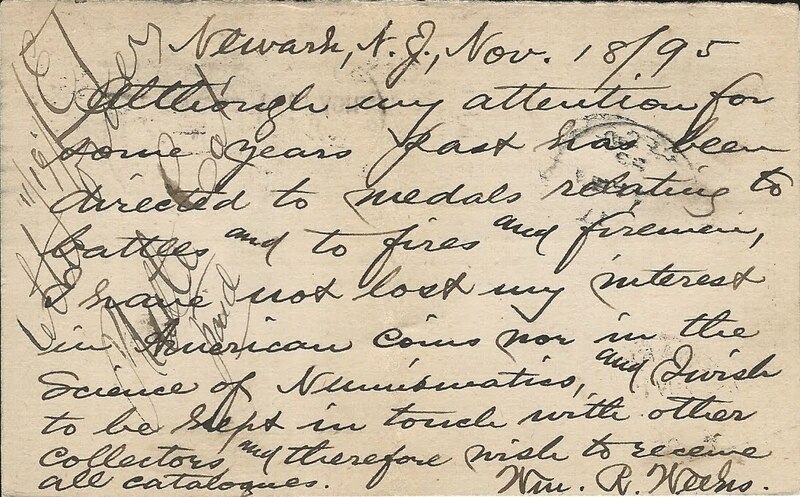 "Although my attention for some years past has been directed to medals relating to battles and to fires and firemen, I have not lost my interest in American coins nor in the Science of Numismatics, and I wish to be kept in touch with other collectors, and therefore wish to receive all catalogues. Wm. R. Weeks." In brown ink penned by the Chapmans "11/19/E letter order Plate Cat paid." Courtesy the Lupia Numismatic Library, Special Collection, The Chapman Family Archive. Fig. 5. 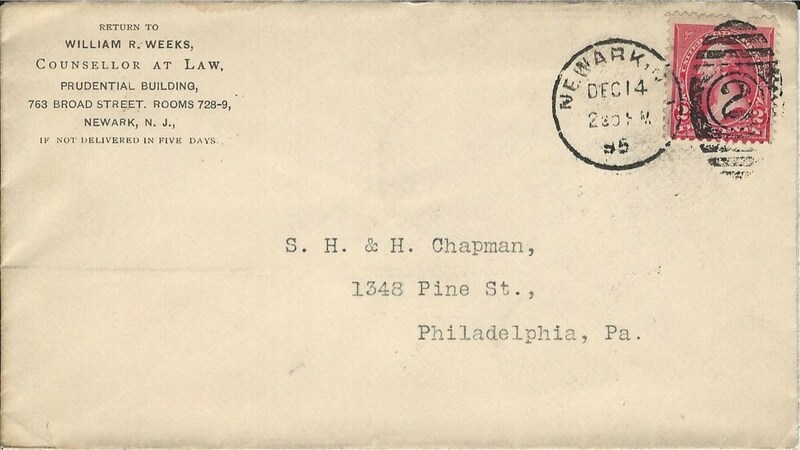 Letter sent by Weeks to the Chapman Brothers postmarked November 19, 1895, Newark, New Jersey, with requests and payment for plated, priced and work plain catalogues of the Winsor sale, as cited in the annotation of the verso of the above illustrated postal card. Note the address correction in pencil. The large ink stain matches the ink used by the Chapmans as they annotated the back with that ink. Courtesy the Lupia Numismatic Library, Special Collection, The Chapman Family Archive. Fig. 6. Verso of the above letter sent by Weeks on November 19, 1895 with the corresponding annotations as cited above. Apparently Weeks overpaid and the Chapmans returned one dollar the following day as noted. The catalogues were to be sent by Adams Express, but at the time of the annotation they were not as yet sent. This shall prove to be a problem. (See below) Backstamped Philadelphia received twice: Clarke No. R-70 and Philadelphia RECEIVED at Station B. (Clarke No. 90c.) Courtesy the Lupia Numismatic Library, Special Collection, The Chapman Family Archive. Fig. 7. Letter sent to the Chapman Brothers by Weeks postmarked December 14, 1895 at 2:30 P.M. Courtesy the Lupia Numismatic Library, Special Collection, The Chapman Family Archive. Fig. 8. Verso of the above letter postmarked December 14, 1895. The Chapmans' annotation : "Weeks has not received a Catalog. sent cat 12/15/95" Weeks received his catalogue the first day of the sale! Backstamped Philadelphia received twice: Clarke No. R-70 and Philadelphia RECEIVED at Station C. (Clarke No. 90c.) The R-70 received stamp with the time as 11:30 P.M. tells us the letter was given to the appropriate station of the letter carrier on the Chapmans' mail route for delivery the morning of December 15th. Courtesy the Lupia Numismatic Library, Special Collection, The Chapman Family Archive. In 1896 he became a member of the Sons of the American Revolution. He was arrested in December, 1901 for extortion and grand larceny of $37,986.16 from the Emma Plaut estate. After his arrest and investigation it was discovered he also stole money from the Edward Lister estate as well. His wife Irene died in 1902 shortly after he was arrested and imprisoned. In order to raise money to pay his debts from the court case following his arrest in December 1901, he had two auction sales; the first was held February 20-21, 1902 at Davis & Harvey selling his autograph and historical papers collections catalogued by Stanley V. Henkels who also catalogued the second auction of his library and sell it at Davis & Harvey, 1112 Walnut Street, Philadelphia, Pennsylvania, on March 5-6, 1902. Afterwards, at New York, he sold his collection combined with the late Augustus Humbert a California Assayer, consisting of 1,392 lots through the Chapman brothers on May 1-2, 1902. Adams rating B. Prices realized of over fifty lots were published in the June issue of The Numismatist. He died at his home in Montclair, New Jersey on October 29, 1919. History of the American Numismatic and Archaeological Society of New York. (1892) 50 pages. American Numismatic Society (The De Vinne Press, 1910) 20 pages.